Overlooking the ocean at the end of the spit, at the edge of Homer. Many riders I've met dream of riding to Alaska, just as my husband Steve did in 2010. Steve rode from Menifee, CA to Fairbanks, AK and back in 30 days, covering thousands of miles. We met for the first time shortly after this excursion. He was aflame with stories of his travels, completely wide eyed and awestruck by everything he saw. From the moment I rode my own I dreamed of taking the trip to Alaska with him. To make it up and back during the ride season I would be required to ride gravel roads, sometimes for days in a row, under the wettest conditions imaginable. Also, there would be cold 500 mile days, many of them back to back. I can't even do that under the best of circumstances. Lastly, my challenge of finding a bike short enough for me to ride that would carry all of the equipment I would need seems impossible. As my time in the saddle increased, I realized the Alaska ride was out of reach for me. Amazingly, Alaska found me. 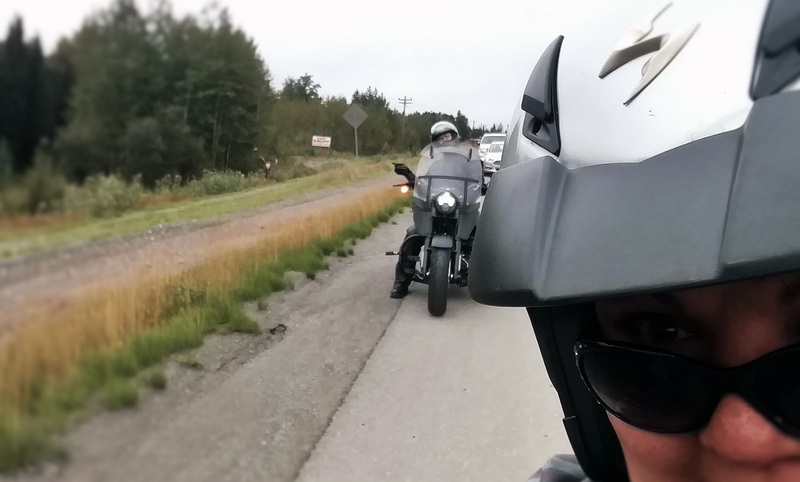 Last year a rider in Sterling, AK came across Steve's blog Motorcycle Philosophy. He most likely was searching for content about riding in Alaska. After reading for awhile he came across information about our marketing company Too Much Tina Marketing. 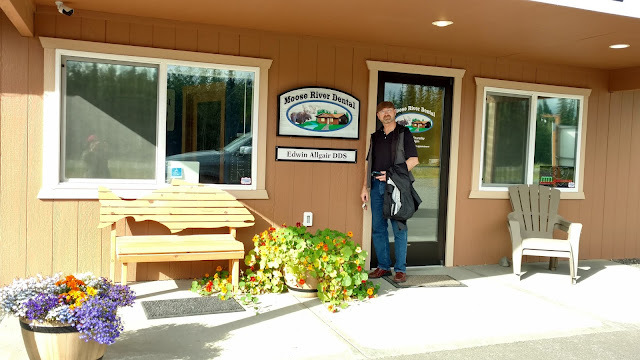 We connected and shortly thereafter I began marketing Ed's dental practice in Sterling, Moose River Dental. Ed closing up his dental office at the end of the day. I've enjoyed working with Ed and his staff and helping him build his practice. But as time has gone by I've felt a disconnect with his patients and his community. "Steve, I think I should go to Alaska." "Go ahead. Who's stopping you?" Steve replied. "Really? I'm going to look at flights right now!" Within hours I had round trip tickets from San Diego to Anchorage. I discussed my plans with Ed and he invited me to stay with his wife Heather and him while I was there. He even offered up Heather's Sportster for me to ride! It couldn't get any better. 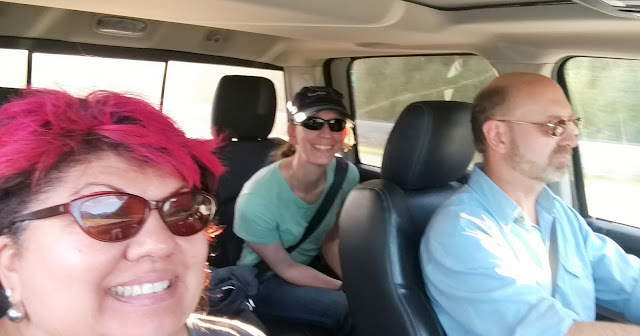 Riding home with Heather and Ed from the Alaska State Fair in Palmer. Two months later I was trembling as I boarded the plane. Steve did all he could to comfort me but I was simply terrified. Alaska seemed a very long distance from home. I was actually surprised by my fear. I had embraced so many challenges and adventures over the last 3 years, yet this had me in a near panic. When I stepped off the plane and saw Ed waiting for me in the airport my fear washed away. For the next 9 days Ed and I spent almost all of our time together. 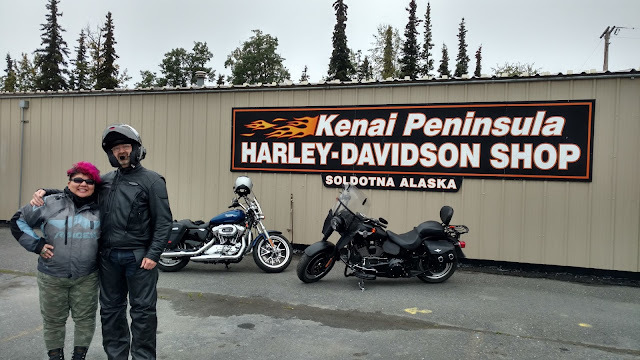 We worked on his business marketing and traveled "The Kenai" (the name the locals have for the Kenai Peninsula) by truck and motorcycles. Ed was the perfect tour guide, always filled with information about the area. When you ride a Harley, you must visit your local Harley dealership. As for us, we were meeting up with the local HOG chapter for a ride. We rode down to Homer and crashed a biker wedding. The bride and groom were complete strangers to us, but it didn't matter. 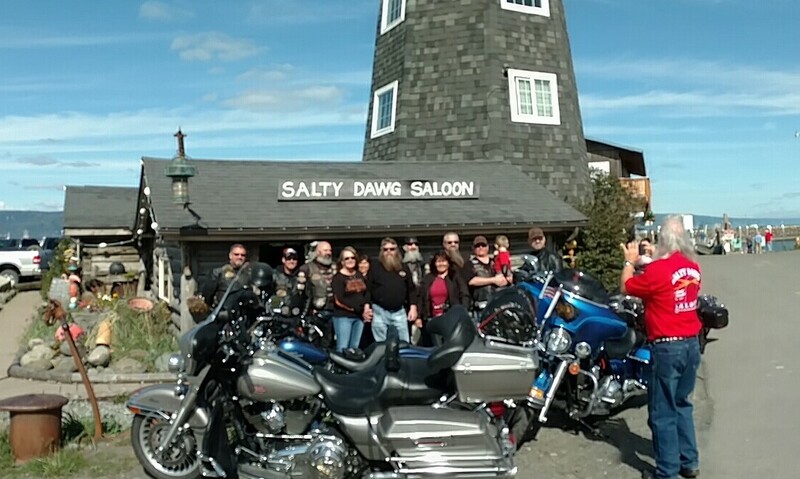 All local HOG members were welcome. 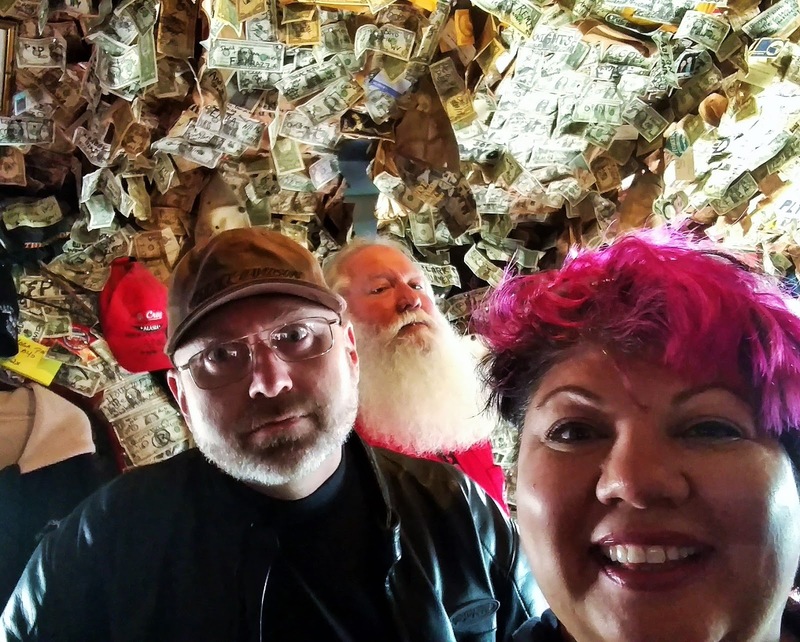 I think Ed was tired of selfies but Santa the Bartender at the Salty Dawg Saloon photo bombed us! 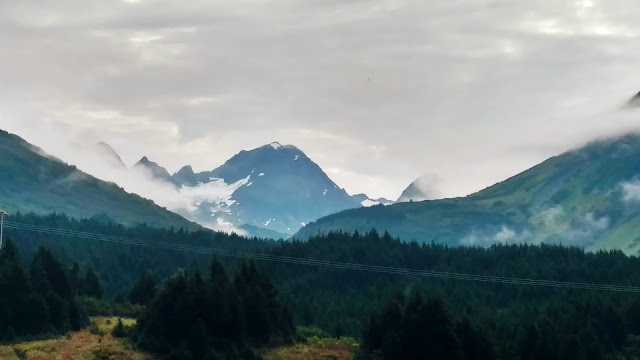 Alaska is a wild, beautiful and untamed as you can imagine. "The Last Frontier", as it is known, is just that: Frontier. Large and dangerous wild animals live among the residents. Black bears, brown bear (also known as Grizzly or Kodiak), moose, caribou and others, each dangerous in their own ways and all deadly. Just so far this year (Aug 2016) on the Sterling Highway over 230 moose were struck by cars and killed. Many of those collisions killed those drivers and passengers of vehicles and I guarantee all of them caused serious vehicle damage. It's hard to see but there is a caribou roadside. We had to ride slowly just in case there were others around. The weather is completely unpredictable, even though locals will tell you the weather forecast is usually right. A mix of sunshine and rain, clouds and blue skies filled my time. 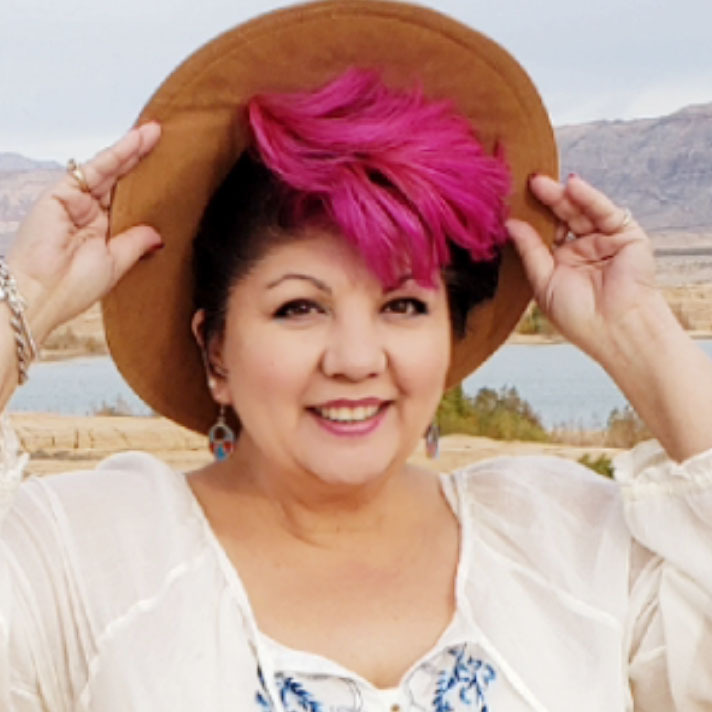 I was fortunate to visit during such a warm time with temperatures from 35 - 80 degrees. 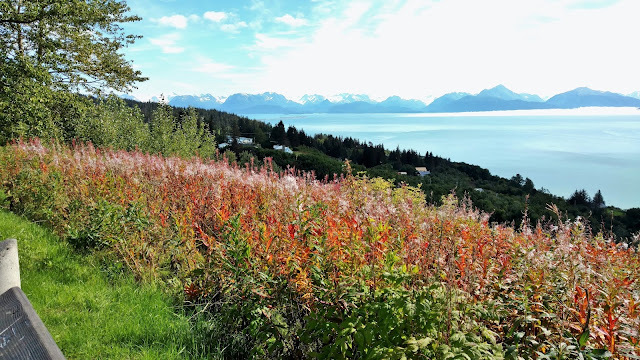 Overlooking the little town of Homer. Even more unpredictable are the roads. Riders must stay ever vigilant for not only a moose or caribou running out from the brush, but road construction. 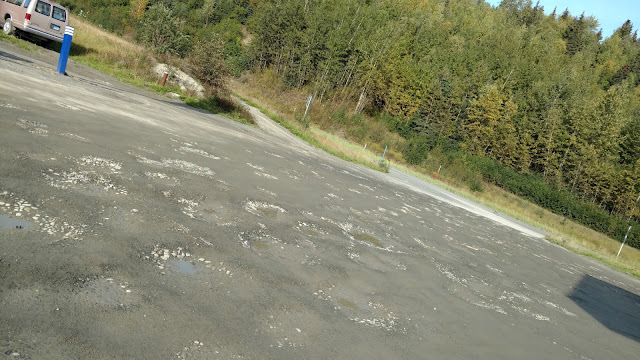 In the areas the roads are being repaved riders may encounter deeply grooved road or asphalt completely missing with only gravel roads for long stretches. You had better be ready to bump and grind in the potholes. You'll find them in every parking lot in the state. These are much deeper than they look, filled with loose gravel and recent rain. The glaciers are stunning. I had to stop and just admire their longstanding majesty. I saw quite a few around Turnagain Arm near Anchorage that just took my breath away. Glaciers can be seen from Turnagain Pass. So gorgeous! Photos don't do them justice. 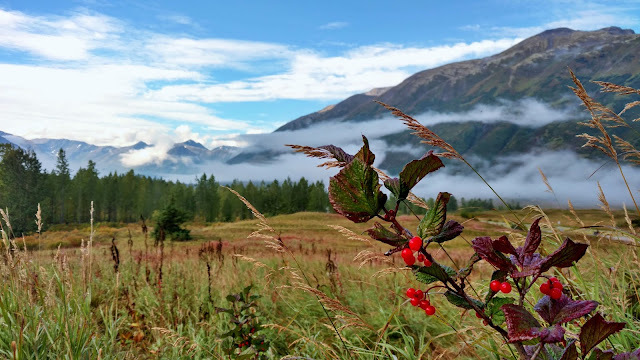 The clouds hugging Turnagain Pass. 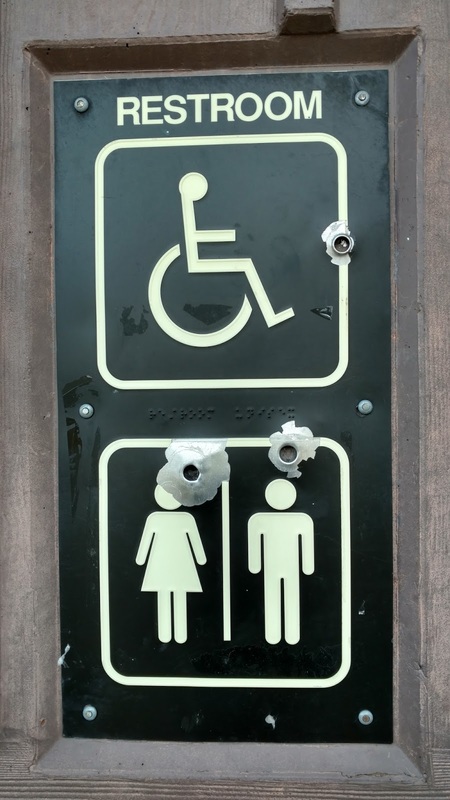 Everyone is armed. Something about all of the wildness appeals to my adventurous side, drawing me in. I realize I'm not as rugged as the residents but I'm attracted to their willingness to meet nature head on. Bullet holes in the metal restroom sign at one of the trial heads. Most residents fish and hunt for the meat they eat year round. I enjoyed fresh wild salmon, reindeer stew and venison jerky. The folks of Alaska are definitely carnivores! Flatbread and Reindeer Stew for lunch at the Fair. 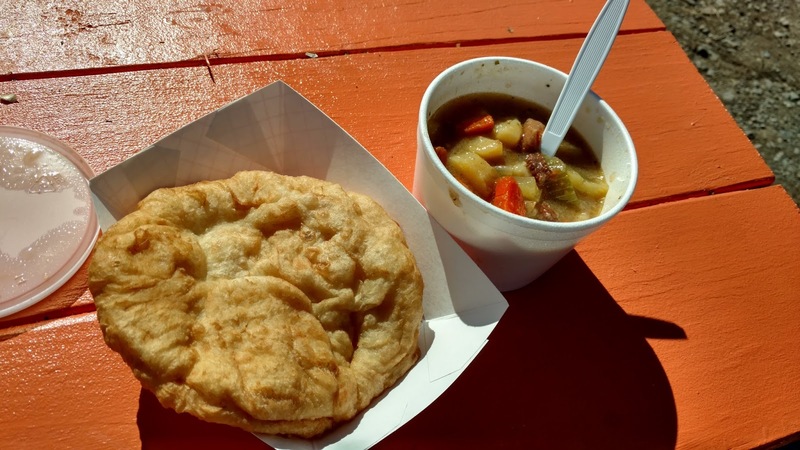 I love the stew, but I love flatbread so much more. When I arrived at the airport I started feeling very sad about leaving. The stuffed polar bear cheered me up a bit, but I knew already that Alaska had stolen a piece of my heart. I've already made plans to return next summer and stay for awhile longer. 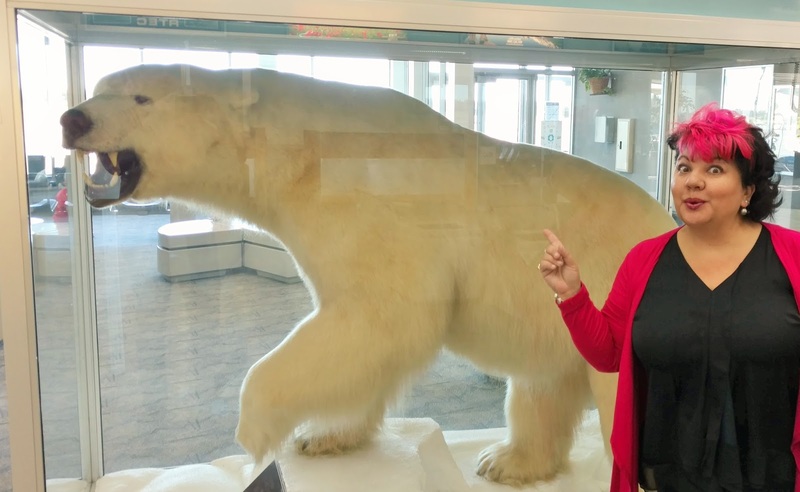 This polar bear is in the Kenai Airport. Stuffed and mounted for travelers like me to gawk at. He's so huge that the thought of running into him in the wild is utterly terrifying. 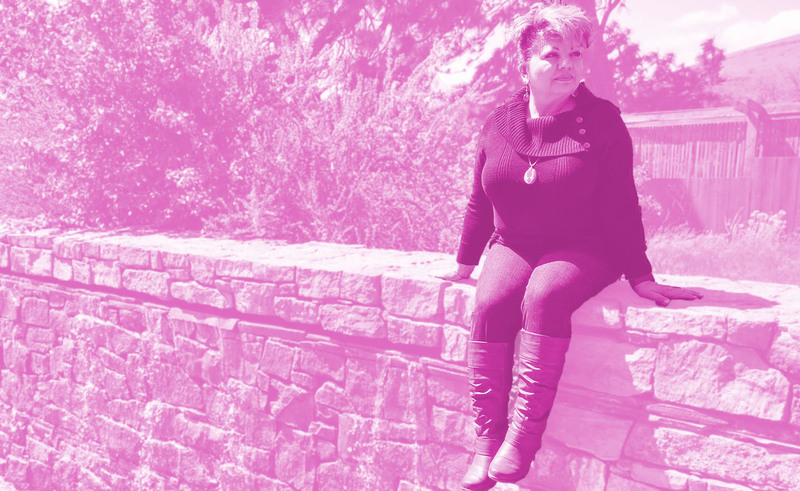 My ebook, "Rude Biker Chick: Lessons From My Daddy" is available for purchase here. Buy your copy now or if not for you, buy a copy for a friend. The woman in your life will love you for it. Thanks! Looks/sounds like a great time! Glad you got to go experience it. What a great excuse to get you up to Alaska . Ed and Heather sound like great hosts for you. Who says you can't mix business and pleasure.